Track 0: Real World MultiMedia introduce 'Ceremony of Innocence', link you to Radio Real World, and leave you with a desktop gift. For Macintosh and PC. Track 1 ℗ 1997 Real World Records Ltd From the forthcoming album 'The Journey' (RW70). Track 2 ℗ 1988 Oriental Star Agencies Ltd/Real World Records Ltd From the album 'Devotional Songs' (RWM2). Track 3 ℗ 1997 Real World Records Ltd From the album 'The Seven Steps to Mercy' (RW67). Track 4 ℗ 1997 Real World Records Ltd From the WOMAD Select album 'Inner Knowledge' (WSCD011). Track 5 artist name on inlay notes is "Nusrat Fateh Ali Khan & Michael Brook: Remixed" but on back sleeve appears shortened (Nusrat Fateh Ali Khan & Michael Brook:). 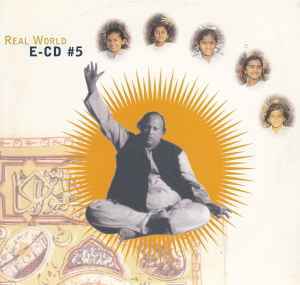 ℗ 1997 Real World Records Ltd From the album 'Star Rise' (RW68) Original track from the album 'Mustt Mustt' (RW15) by Nusrat Fateh Ali Khan. Track 6 ℗ 1997 Real World Records Ltd From the WOMAD Select album 'Chimurenga: African Spirit Music' (WSCD104). Track 7 ℗ 1994 Peter Gabriel Ltd/Real World Records Ltd Soundtrack from the Oliver Stone film 'Natural Born Killers'. This compilation ℗ 1997 Real World MultiMedia Ltd. This compilation © 1997 Real World MultiMedia Ltd.